2.) Otherwise Ossowo, church village, called a small town, on a river of the same name, Lida district, in the 2nd police precinct, Aleksandrowa gmina, Horodna [Horodnia] rural district, at 14 wiorsts from the gmina, 19 wiorsts from Lida, and 71 wiorsts from Wilno, has 4 houses, 60 inhabitants, namely, 27 male and 33 female (in the year 1864, 22 revision souls); belongs to the state treasury rectory of Osowo. There is here a Catholic parish church dedicated to St. Jerzy (George), wooden, endowed in 1666 by Kazimierz Frąckiewicz and Ogiński, rebuilt in 1732. Catholic parish, Raduń deanery, has 2,902 faithful; chapel in Horodna. The surrounding area is somewhat hilly, few forests, many meadows; flowing are the Rivers Dzitwa, Żyżma, Osówka, and Pohorodenka. 3.) Village, Lida district, in the 1st police precinct, Bielica gmina, Tobola rural precinct, at 5 wiorsts from the gmina and 31 wiorsts from Lida, has 21 houses, 231 inhabitants, (in the year 1864, 98 revision souls); belongs to the estate of Stoki, Prince Wittgenstein. All text & photos copyright © 2009-2014 by Barbara Proko. Baniukiewicz — Łopaty, Żołudek par., & Szczuczyn par. Blaszko — Skladance & Bastuny, Raduń par. Bogdan — Odwierniki, Raduń par. Boutromon — Skladance, Raduń par. Bowszys — Skladance & Kiwance, Raduń par. Chwiedziuk — Wity, Szczuczun par. Czerniawski — Kiwance, Raduń par. Doda — Wojkunce, Ossów par. Hayduk — Borsuki, Lack par. Jusewicz — Orla, Raduń par. Kulikowski — Jatowty, Raduń par. Linga — Kiwance, Raduń par. Lukaszewicz — Smilginy, Raduń par. Mickiewicz — Kaleczyce, Lack par. Nowicki — Bojary & Kiemiany, Iszczolna par. Nowogrodzki — Kozly, Wasiliszki par. Piwowarczyk — Kozarezy, Iszczolna par. Prokopowicz (Aleksandr) — Kozarezy, Iszczolna par. Prokopowicz (Julian) — Odwierniki, Posada, & Polunce, Raduń par. Przyjemski — Podzitwa, Raduń par. Rouba — Iszczolna town & par. Ruchlewicz — Wasiliszki town & par. Ruśćik — Staro Gierniki, Szczuczyn par. Sobol — Staro Gierniki, Szczuczyn par. Staniejko — Janczuki, Szczuczyn par. Tumielewicz — Narkuny, Żyrmuny par. Waszczynska — Janczuki, Szczuczyn par. Witkowski — Iwaszowce, Iszczolna par. Żubrzycki — Wasiliszki, town & par. ; Iszczolna, town & par. ... my curiosity about my family's past was fed by the stories Stefania told me, and the stories I never had a chance to hear from Alek and Julius, and the stories I failed to seek from Anna. The Prokopowicz surname is common in the lands of the former Polish-Lithuanian Commonwealth—today's Poland, Lithuania, and Belarus. The geographic focus of this DNA project is the area bounded more or less by Vilnius (Wilno), Lithuania, to the north; Hrodna (Grodno), Belarus, to the west; Navahrudek (Nowogrodek), Belarus, to the south; and Minsk, Belarus, to the east. The specific geographic focus is the Lida area of Belarus, from Scucin (Szczuczyn) in the west to Radun, north of Lida. The goals of this project are to determine which if any of the various Prokopowicz families in this geographic area share a common male ancestor, and to identify relationships between branches of the Prokopowicz families who in recent generations may have become estranged due to immigration, war, deportation, etc. During my visit to Ellis Island in 2005, I was thrilled to discover that the bookstore carries the Polish community books I have coauthored for Arcadia Publishing. On display here is The Polish Community of New Britain. Applebaum, Anne. Between East and West: Across the Borderlands of Europe. New York: Pantheon Books, 1994. Babinski, Mathew. By Raz 1937. [n.p.] 1978. Baliński, Michał. Starożytna Polska, pod wzgle̜dem historycznym, jeograficznym i statystycznym opisana. Warszawa: Nakładem S. Orgelbranda, 1846. Gajewski, Mirosław. Nasze podwileńskie ojczyzny. 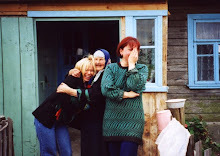 Wilno: Czas, 2002. Kordasz, Józef. Lida Prawdziwa. Olsztyn: 1997. Malewski, Czesław. Rody szlacheckie w powiecie lidzkim na Litwie w XIX wieku. Wilno: Wydawn. Czas, 2002. Marsden, Philip. The Bronski House: A Journey Back. New York: Arcade Pub, 1997. Mickiewicz, Adam, and Kenneth R. Mackenzie. Pan Tadeusz. New York: Hippocrene Books, 2007. Miłosz, Czesław. The Issa Valley. New York: Farrar, Straus, Giroux, 1981. Potašenko, Grigorijus. The Peoples of the Grand Duchy of Lithuania. Vilnius: Aidai, 2002. Proko, Barbara, and Janice Baniukiewicz Stickles. Worcester County's Polish Community. Images of America. Charlestown, SC: Arcadia Pub, 2007. Proko, Barbara, John Kraska, and Janice Baniukiewicz Stickles. The Polish Community of Worcester. Images of America. Charlestown, SC: Arcadia, 2003. Rąkowski, Grzegorz. Ilustrowany przewodnik po zabytkach kultury na Białorusi. Warszawa: Burchard Edition, 1997. Reymont, Wladyslaw Stanislaw. The Peasants: Autumn, Winter, Spring, Summer, a Tale of Our Own Time. New York: A.A. Knopf, 1928. Shea, Jonathan D. Going Home: A Guide to Polish-American Family History Research. New Britain, CT: Language & Lineage Press, 2007. Spear, Marilyn W. Worcester's Three-deckers. Worcester, MA: Worcester Bicentennial Commission, 1977. I am descended from two apparently unrelated Prokopowicz families with Polish Roman Catholic roots in the Lida area of what is now western Belarus (at one time Wilno gubernia of Russian Poland). My grandparents immigrated to the United States before World War I and settled in Worcester, Massachusetts, where I grew up. I am a journalist and the lead coauthor of The Polish Community of Worcester (Arcadia, 2003) and Worcester County's Polish Community (Arcadia, 2007). Active in genealogy since 1996, I am a member of several genealogical societies and the founder/moderator of the PolishMass Yahoo! Group. I conduct presentations on Polish genealogy, documenting local and family heritage through vintage images, and the history of Polish settlement in Massachusetts. I have traveled to Poland, Belarus, and Lithuania to visit my ancestral villages and meet long-lost cousins. If I could time-travel, I would go back to Lida powiat to meet my great-grandparents and earlier ancestors. Basia's Polish Family: Wilno > Worcester by Barbara Proko is licensed under a Creative Commons Attribution-Noncommercial-No Derivative Works 3.0 United States License.